What do we mean by “good access”? 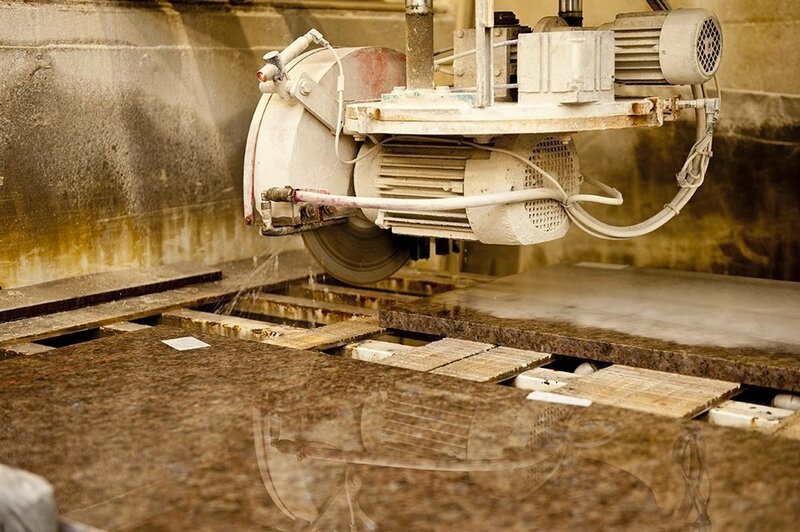 Granite worktops are extremely heavy and so dense that handling them is a challenge. 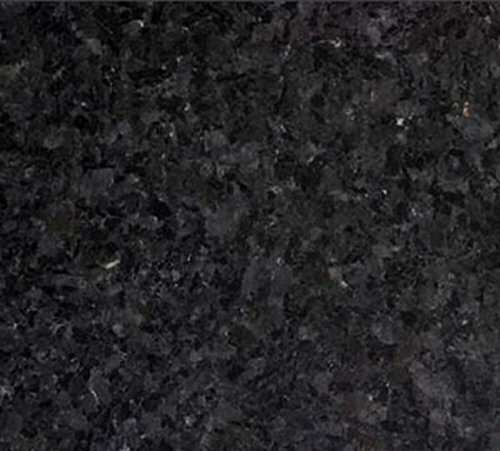 For example, a 2.5m slab of Nero Assoluto granite weighs 154kg (340lbs) and it is not unusual for our fitters to handle slabs (particularly islands) twice that weight. 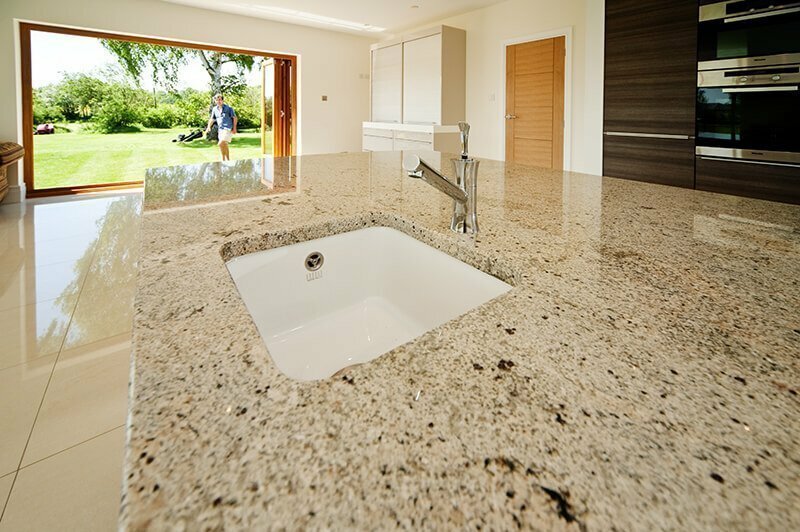 Although quartz worktops are somewhat lighter, due to their plastic/resin content, they still weigh more than most people could even contemplate. To assist us, we use sets of wheels and other lifting aids where we can but it so often comes down to the sheer strength of our fitters. Obviously long distances from parking spaces, rough ground where trolleys cannot be used and steps or sharp turns in corridors can make installation very difficult. 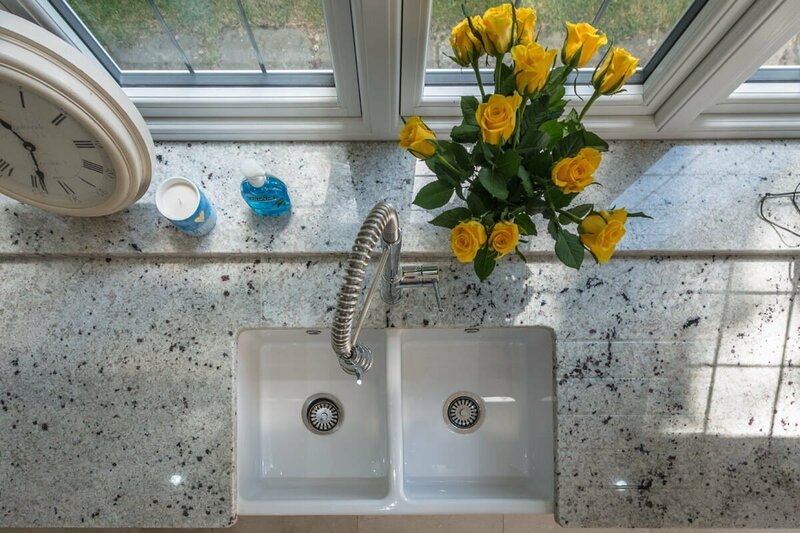 Natural stone worktops are very hard but stone has limited tensile strength so worktops are always transported while vertical to prevent damage or breakage. They should also be laid flat onto properly levelled kitchen units. Flights of stairs can make our job very difficult and, in some cases, impossible as we are unable to use trolleys or lifting aids so whoever is carrying the bottom of the slab is put under incredible strain. Lifts can also be more tricky than may appear as they are often restricted in space so manoeuvring a slab into a vertical position is hazardous. Slabs which have sink and hob cut-outs, while lighter, are also significantly weaker, and this also makes handling more difficult. Please let us know the number/flights of stairs and if there are corners on the stairs. 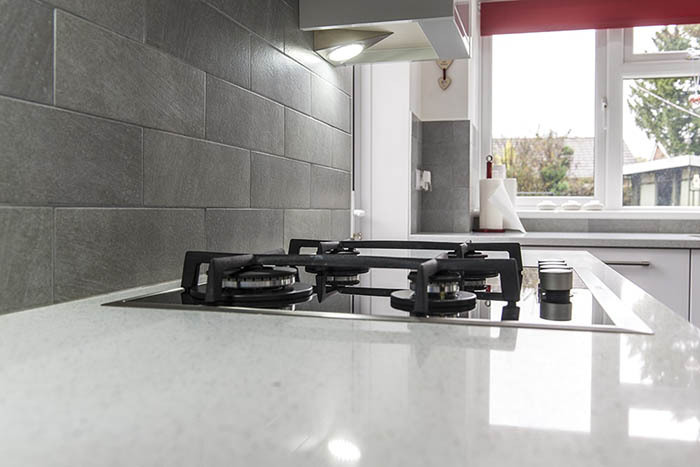 We will evaluate the situation on templating and, occasionally, this may mean reducing the individual lengths of worktop to accommodate these restrictions. For the above reasons, it is important that on the day of installation we are able to park our van as near as is possible to the entrance of your property. We cannot offload all the worktops into the front garden and then park a distance away as during the installation we will need access to the van and may need to work from the back of it. Please let us know if we are unable to park close to your property, if there are parking restrictions, metered parking or if a permit is required. Please let us know if there are any special requirements for gaining access to the site. Please let us know if the outside area is not easily passable, it may be best to wait until the driveway has been made or there is hard-standing outside the property. Please note that we cannot negotiate scaffolding whilst carrying granite. 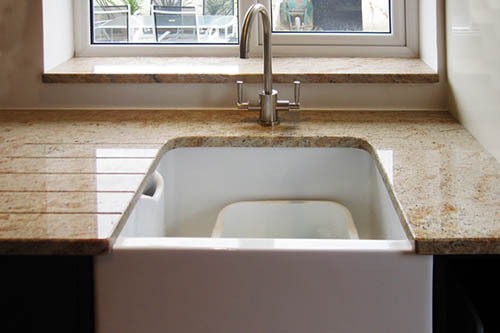 In cases of difficult access, the maximum size of kitchen worktops and islands that can be fitted may be restricted. Hob slabs, in particular, may need to be manufactured with joins at the hob to avoid fractures during installation. It is helpful if access issues are mentioned at the beginning of our quotation process as provision of additional labour needs to be factored in. In extreme cases we may need to use a spider crane or other manual handing equipment. These circumstances are rare but would involve extra costs and site surveys. It is important that access restrictions such as the above examples are identified by you at the time of requesting a quote as there may be price implications, a need for adjustment of the slab or worktop size and / or additional equipment required to fulfill the job for you. 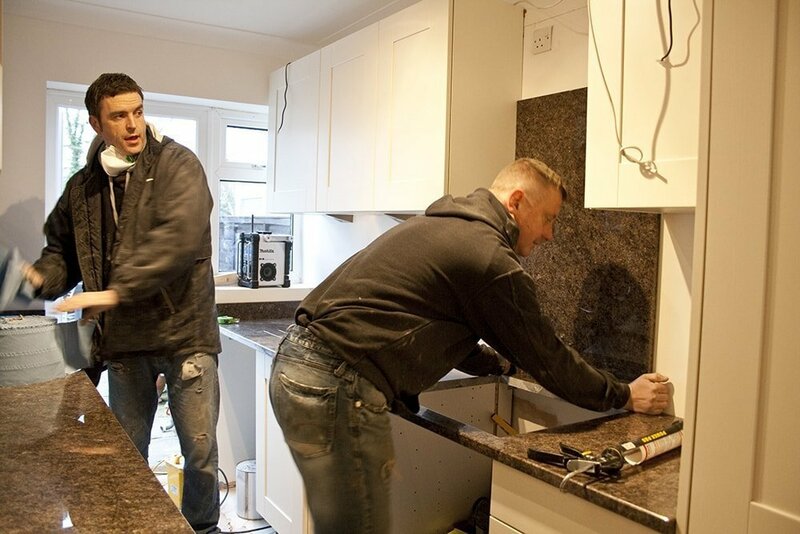 The situations that we have indicated above are not usually insurmountable hurdles to having your worktops fitted and the problem solving skills of our installation team mean that in nearly all cases a solution can be found. However, if extra man-power or specialist lifting equipment is required or the installation is likely to take twice the number of man hours then there will be additional costs. In the unlikely event that a suitable solution cannot be identified at the time of templating or the cost of machinery hire is too high then we will of course refund your deposit. The health and safety of our staff and customers is of paramount importance so the decision of the templater and Manager in charge of your fit will be final.